Silk screening is a stencil-based process. For each separate color, I create a positive (black on clear acetate). The stencil is then embedded in fabric (originally silk, hence the name, now polyester), stretched over a wooden frame. When the stencil is dry, the backing is peeled off and the fabric holds all the areas of the stencil together. 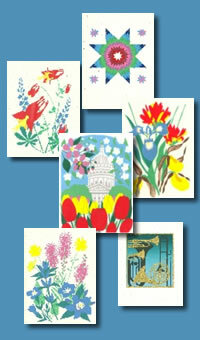 This process is repeated for each separate color in the design. A number of years ago I began using computer graphics for designing and I have created a number of different designs. 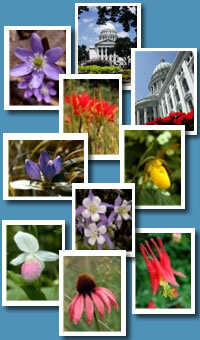 The WI wildflowers, Madison Mosaic and Madison Campus Landmarks designs were all created from photos that I took. For the Christmas designs some elements come from things I've photographed and some are complete products of my imagination (with the capacity for creating, changing . . . allowed by computer graphics it allows me lots of chances to keep trying until I get it right). 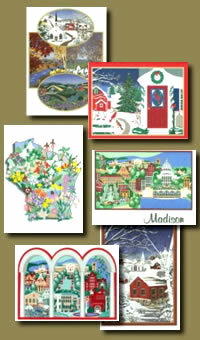 All of my original computer graphics designs are then commercially printed for me, here in Madison. I love photography and gardens - what better way to mix the two than photos of flowers! Over the years my parents and I took many wildflower walks in the area. After I got my own camera I began capturing a lot of the flowers I saw in photographs. Someof the subjects of these photos are in natural areas such as the UW Arboretum, some were taken during the years I lived in NY State and some are in my own yard. Photos of the Madison area and our beautiful Capitol building are also among my favorites.